Hearing loss affects more than 10 percent of Americans…and even though it’s common, it can be tricky to talk about.There’s lots of denial around hearing loss (“Not me!” / “But I’m not old!” / “My doctor never said anything!”), but it’s important to address problems early so they don’t get worse.Think it’s time to discuss the subject with a loved one? Here are a few tips that might help. 1. Choose the time and place carefully. Pick a calm, quiet setting with no distracting background noise. Choose a time when your loved one isn’t stressed or distracted. Talk clearly, in a position where your loved one can see your face and gestures. 2. Express love and care. Don’t accuse or create guilt. Reiterate that you care for your loved one and want to see him/her enjoy life fully. 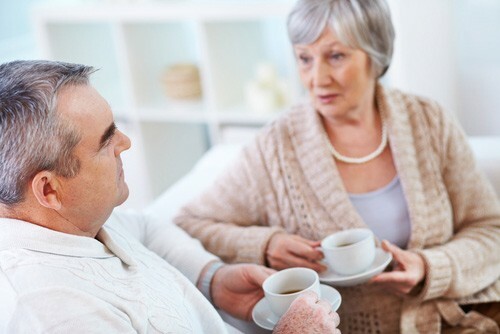 Express how the hearing loss affects you or other family members — maybe you’re attending more social functions alone because your loved one is withdrawing, or maybe you’ve noticed that important instructions have to be repeated. Keep an even, compassionate tone. Many people worry that hearing loss will make them look weak, damaged or “too old.” Smash those stigmas. Go for an annual hearing checkup yourself, or go along to your loved one’s appointment for encouragement. Hearing aids today are much less bulky than in years past. And there are options for every lifestyle and budget. Check with a doctor to get more info about models, prices and the fitting process so that these uncertainties don’t delay someone in getting hearing-loss help. Research shows, the No. 1 reason people eventually seek help for hearing loss is because of family encouragement. Stay patient and persistent if it takes more than one talk. We welcome our patients to bring a spouse, child or friend to appointments for moral support, if needed. So we’re not just here for our patients…we’re here for those who care about them. Give us a call anytime if you need personalized advice.